Several research studies have suggested a connection between season of birth and early fetal development. Researchers from the University of Lodz recently published a study in The Archives of Oral Biology claiming a connection between enamel production and season of birth. The connection affected prenatal enamel production, but not postnatal enamel production. Sixty incisors were collected from mothers for the study. Mothers were asked to fill out a questionnaire revealing prenatal or pregnancy details. Teeth were sectioned with a diamond blade. Prenatal and postnatal enamel was measured. Researchers found that children in utero in autumn and winter (born in summer and spring) measured the thinnest prenatal enamel layer. 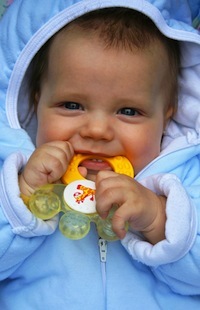 Season of birth did not appear to affect postnatal enamel production. Source: Ządzińska E, Kurek M, Borowska-Strugińska B, Lorkiewicz W, Rosset I, Sitek A. The effect of the season of birth and of selected maternal factors on linear enamel thickness in modern human deciduous incisors. Arch Oral Biol. 2013 Apr 10. pii: S0003-9969(13)00077-0. doi: 10.1016/j.archoralbio.2013.03.004.